SWBAT explain that traits are observable characteristics that are passed down from parent to child, and use a trait inventory to create a bar graph. What does genetics have to do with me? After a couple of volunteers have answered, I write the words "dominant" and "recessive" on the board and ask again for volunteers to review their notes and tell the class what these words mean in the context of genetics. At this point, students might still answer that a dominant trait is expressed most often. I purposely do not dispel this misconception yet since the students will be able to revise this thinking towards the end of the lesson. I tell the students that today they will discover if they express any dominant or recessive traits. I hand out the Trait Inventory sheet and explain how to answer it. 1. Determine their own traits (observations) with assistance from a partner or mirror. Do not attempt to answer the "dominant or recessive" column. 2. Pool their observations at their tables to create a bar graph of their observations (SP4: Use tables, graphs spreadsheets to display and analyze results). 3. 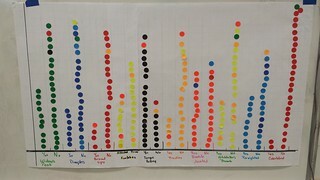 Using the bar graph you created, discuss with your table whether you believe the trait is dominant or recessive (SP7: Engage in argument from evidence). Document your answers on the second column of your sheet (XC-P-MS-4: Graphs, charts, and images can be used to identify patterns in data). 4. Answer the rest of the questions in your sheet. I do not provide the Dominant & Recessive Genes sheet until after they have answered at least questions 1 and 2, and made a preliminary identification of dominant vs recessive so as not to influence their answers. After students have completed the activity, I reconvene the class and ask for volunteers to share their ideas about dominant and recessive genes. During this class discussion I interject the idea that dominance "just" means that if you have the gene you express it. It does not mean that it is expressed more often (common misconception). I use the Dominant & Recessive Genes sheet, as well as the graphs they created, as evidence that this assertion is true. The student work (SW 1, SW 2) gives me the evidence I need to determine that the students correctly grasped this concept. I invite you to watch the video included in the Tips for Implementation reflection where I share some ideas that could help make your presentation of this lesson run smoothly. To close this lesson, I ask the students to write down the words dominant and recessive on post its, and integrate them in the concept map they created the day before. Finally, I have the students use write a post-it note on my reflective chart. This chart is posted at the front of the room, and gives me a quick reference into student thinking and attitudes in the classroom.